The show, produced by Kansas City radio station KCUR – 89.3 FM, will feature several local film critics discussing current releases as well as what people look for when they go to the movies. You can listen online by going to www.kcur.org. Blackberry Z10 – A Phone That Offers Bang For Your Bucks! In the first few minutes of “Magic Mike” the audience is given a great piece of advice: If you meet a woman whose name is similar to a car, flower or stone, don’t ask what she does for a living. “Magic Mike” is a modern look, with a sometimes retro feel (the film opens with the mid 1970’s Warner Brothers logo), into the world of male entertainment. Mike (Tatum) is a 30 year old “entrepreneur” who dances for dollar bills in the hopes of raising enough money to fund a business making furniture. He also works construction, details cars and pretty much anything he can to keep the cash coming in. One day at work he is saddled with supervising Adam (Pettyfer), a clueless young man who shows up at the job site in tennis shoes. Mike gives Adam a ride home after work and invites him to meet him later at his second job. Adam is surprised to learn that Mike is a male dancer but, promised a good payday at the end of the night, accepts a job at the club as the dancer’s assistant…getting props and costumes ready. As fate would have it, one of the dancer’s misses a cue and Adam is thrust out on stage. He very nervously entices the crowd and soon finds himself on the roster, advertised as The Kid! At first look you wouldn’t expect to see Steven Soderbergh’s name attached to a project like this. But it’s only his skill behind the camera that gets the film through its clunky parts, which is really the parts of the film that don’t take place in the club. Based in part on Channing Tatums real-life experiences during his eight months of “dancing,” the story is really about Mike’s efforts to better himself. Tacked on romance (Mike has a thing for Adam’s sister) and a drug-dealer subplot often stop the film in its tracks, which is a shame because the action on stage and behind the scenes is fun to watch. McConaughey is the most fun, playing a character named Dallas. Dallas owns the club and hopes to expand from Tampa to Miami. He’s also the Mr. Miyagi of male dancing, giving advice to anyone who will listen. It’s clear McConaughey is having fun with the role and that enjoyment radiates off the screen. Tatum continues to grow as an actor. He builds on the comedic goodwill he earned with this year’s “21 Jump Street” and also proves himself one hell of a dancer. Where the other actors in the film have occasional flash Tatum is a one man dance recital. Mike Mushok is the guitarist for the band Staind. The band is currently part of the Mass Chaos Tour which includes Godsmack and Halestorm. Media Mikes had a chance to be a part of a teleconference with Mike to discuss the tour. Adam Lawton: In the last couple of years there have been a lot of bands teaming up for multi band headlining tours. Is this a reality of the music business today? And are these larger scale tours something that needs be done in order to survive? Mike Mushok: In my opinion it’s something we’ve always tried to do. I know we always try to put together the best package we can. I think in this economy it’s tough for people to have extra money to be able to go to a show. It’s kind of a luxury. The more bang for the buck you can give them, I think the more likely chance you have of getting people there and, hopefully, give them the most value for the dollars. That was really the idea for us and we had this record and we were looking to who we could play with. Godsmack was like, “That would be fantastic if those guys wanted to do it.” So, we went and put it together. AL: How do you think the Staind of 2012 compare with the Staind of 1995 or 1999? MM: We have a different drummer now so that’s one big difference. I think what we did with this record was to kind of come back to what Staind of ’99 was. That was really the idea behind it, to kind of get a little more aggressive. The reason we started the band was to play more aggressive music. We kind of went on this journey and I think the last record we lost the progress. I enjoy the journey. I love some of the songs on the last record, but I think after completing that we said, “Let’s kind of go back to why we started the band,” and that’s really what the idea was behind the album. Aaron also has a solo thing going on now, so that kind of ties up his time. It makes it a little more difficult to get all the time we need for STAIND. So, those are really the big differences. AL: How did drum tech turned band member Sal Giancarelli end up being the new drummer for the band? and how have you seen him change both musically and personality since his promotion? MM: Sal has been with the band since ’99 and previous to that he was in bands that we used to play with. We always knew he was a great drummer. Even during his career as a drum tech he had other bands that he tried to pursue a career in music with. Being able to be a drum tech was a way of getting out there and kind of getting some of his stuff out there. There were a couple shows where John was sick and Sal filled in. So this wasn’t the first time Sal played with us. Sal just seemed like the perfect fit to go from behind the drums to playing them. He knew all the material and we knew he could more than handle it. Personality-wise he’s the same guy. We had these web-isodes on our website where we made him seem like this big egotistical guy and wanted to name the band after him, it was all a joke. Sal’s the most quiet, down-to-earth guy you’ll ever meet, and he hasn’t changed one bit. Sometimes when you introduce someone else, it’s a whole other personality. We knew his personality. He’s been on the road with us for 12-13 years so he was already part of the family. AL: Besides the new drummer did anything change on the last album? And are the same problems that were there before this hiatus still there? MM: No. We made the record basically the same way we always make a record. I’ll come in with a bunch of ideas. We get together and figure out what Aaron likes and wants to sing over, and then pretty much finish them and start tracking. Making the record was pretty tough. I mean, losing John along the way wasn’t easy. We had a deadline to meet for the label. Aaron put up the solo record. As far as problems go, I mean, I don’t know. You play with somebody and you’re around somebody so much there’s always issues. Did they go away? I mean, look, we just deal with them. We’re all adults. We’ve been able to maintain this for a long time and I think that you have to pick your battles. I think between Johnny, Aaron, and I we can say pretty much what we want to each other and realize that the band is what’s important. And that’s why people ask me when we’re doing a record. They thought we were going to break up. No, we knew we had to finish the record and that’s what we wanted to do, but you kind of work through all of those things. It takes people making compromises and being able to admit sometimes when you’re wrong and being able to give in. AL: “Not Again,” was released last summer. Do you have any plans to release additional singles and any videos from the new album? MM: No, that’s it. We’re calling it quits. Yeah, there’s a single, “Eyes Wide Open,” is out now, and we’re trying to figure out what’s going to be next. There’s a live video that we did with “Eyes Wide Open” also. So, yeah, we’re on single number two now and I think its top ten or something. AL: Was there any real thought process or purpose behind making this album self-titled? MM: Yeah. We really wanted to kind of go back to where we started as far as a band, and I think that was kind of why we ultimately decided on having it self-titled. I mean, there was talk about it being called, “Seven,” because this is the seventh record and that’s what seven demons on the cover kind of represents is that. That’s kind of how we ended up incorporated that. But, no, it was really just about the fact that we kind of got back to playing with the music. AL: Staind has been together for 15 years or more now. What would you say are the biggest reasons for the band lasting that long? MM: I think all three of the bands on this tour know that if it wasn’t for the fans, we wouldn’t be here. They allow us to do this. Those are the ones that buy a ticket, come to the show, support the bands, and, I mean, that’s why we’re still around obviously. We do our best to write the best music we can. I know Lzzy and Sully do also and you try to put out the best product that you can and you hope that people like it and want to listen to it and be a part of it. So, we’ve been fortunate so far and, hopefully, we can continue. Mike Portnoy is best known as one of the founding members and drummer of the progressive rock group Dream Theater. Portnoy’s latest project Adrenaline Mob which features members of Disturbed and Symphony X is set to release their first full length album on March 13th. Media Mikes had a chance recently to talk with Mike about the group and the upcoming album. Adam Lawton: How did you first get asked to be a part of Adrenaline Mob? Mike Portnoy: I have known Russell Allen for many years. Our bands had toured together a couple times and we became very good friends. I have always admired his voice and I think his is one of the best in the business. He is someone that I have always wanted to work with. When my time with Avenged Sevenfold came to a close in 2010 Russell called me up to ask if I would be interested in checking out some material he had been working on with a guy by the name of Mike Orlando. At first I was sort of anticipating material along the lines of Symphony X and Dream Theater. Honestly I wasn’t interested in doing material like that as I wanted to go into some new musical places. I was pleasantly surprised when I hit play and heard the song “Undaunted”. It was exactly what I was looking for and I was instantly on board. It was the right band at the right time. AL: Can you describe what the writing sessions were like? MP: The writing happened before my involvement. Mike Orlando has this graveyard of songs and riffs that he has been just waiting for the right band to use them with. He had been working with Russell Allen probably a year or two before my involvement with the project. By the time they asked me to be involved I would say around 80% of the music had been written. I did some shaping and arranging but for the most part everything was there. AL: How do you think you’re playing on this album differs from that on the Dream Theater and Avenged Sevenfold albums? MP: I think this stuff is more in line with what I did with Avenged Sevenfold. This was the next natural step in the evolution of that kind of drumming in my life. With Avenged I was out on the Uproar Tour surrounded by bands like Disturbed, Hellyeah and Stone Sour. All these bands are very song oriented and they have a bounce to their grooves. I was very excited playing that kind of music. It’s fun and doesn’t require you to over think anything or play really technical parts. There is nothing wrong with doing that kind of playing but I was looking for a breather. This music definitely is the next step after my drumming on the “Nightmare” album. Having that bounce was the real priority to on “Omerta”. I still wanted it to have my personality and character which I think it does but, have it be restrained somewhat. AL: Is there a track off the album you are really looking forward to playing live? MP: At this point we have played everything live already. Every one of these songs comes alive on stage. They are all really energy driven. Songs like “Undaunted” and Psychosane” have a lot drive while the song “All on the Line” serves as a nice breather and a showcase for Russell’s melodic side. When we were playing with Godsmack that song got a great response every night. All the songs serve different purposes depending on what you are looking for. AL: Where did the idea come from to cover a Duran Duran song? MP: Mike Orlando and Russell presented that to me at the same time they were showing me all the other material. I had thought it was an original because I never heard the Duran Duran version before. I guess that said something for how well it adapted to the rest of the material. I don’t know which guy actually came up with the idea but it surely works with the rest of the material. Lzzy Hale’s vocals on that track are a whole other attraction. It’s amazing hearing her and Russell trading off together. AL: What do you think will make this album stand out from others in the rock/metal genre? MP: I think the thing with Adrenalin Mob is we are taking the song writing structure of bands like Disturbed and Godsmack while keeping with the shred factor. Mike Orlando is an incredible player along the lines of Zakk Wylde and Dimebag Darrell. Add my prog background in and you get something very different. Honestly we aren’t trying to break any new ground with the style of this group. We want to write some great tunes with great riffs and melodies. We are not trying to reinvent the wheel. We just wanted to make an album with great songs that are enjoyable to listen to. Mike Orlando is the guitarist for the rock/metal super group Adrenaline Mob. 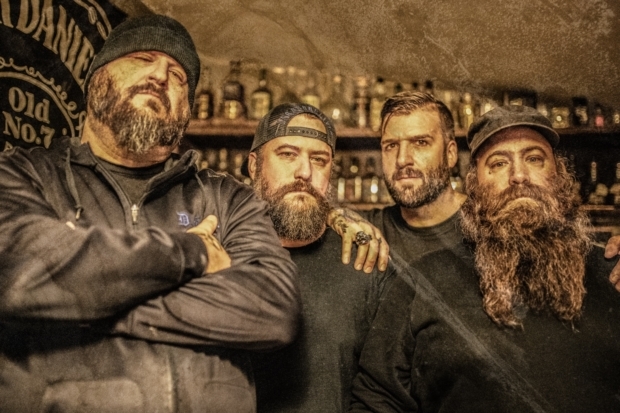 The group is set to release their debut full length album titled “Omerta” on March 13. Media Mikes had a chance to talk with Mike about the album and what it was like playing both bass and guitar on the album. Adam Lawton: Can you tell us what inspired you to put the band together? Mike Orlando: I had been rolling with the vision and the songs for quite some time. This was even before I had met Russell Allen. Line ups don’t work out or people don’t live up to certain expectations so it’s been in the works for some time. I was working with Russell on writing his second solo album off and on for about 3 years. We are always both on the road so it’s been tuff to get the album done. I brought the tracks to Russell to check out one day and it was just magic. It was exactly what I was looking for. AL: What was yours and Russell’s writing process like? MO: I had brought Russell all of the pre-recorded material. Everything was tracked so Russell would either sing on the songs the way they were or we would make some changes to make the tunes work better. AL: Was it hard balancing both guitar and bass playing duties during the recording process? MO: No. I love playing bass. I actually have played bass on all of my solo albums. If it has strings I will play it. I never approach the bass like a guitarist. I use my fingers not a pick. It’s very much like John Entwistle who is one of my heroes. I try to look at the tracks like a bass player would as you can’t play bass the way you play a guitar. I think it comes off stiff when you don’t approach it differently. It’s great having John Moyer from Disturbed playing bass in the band now. I told him to do whatever he wanted and to make the songs his own. I gave him the guidelines and he has done a hell of a lot more from what I gave him. AL: Can you tell us the idea behind covering the Duran Duran song “Come Undone”? MO: That song has been one of my favorites since hearing it when it came out in 1991. I don’t walk around screaming “Hungry like a Wolf” or anything (Laughs) but “Come Undone” is like my favorite song from that band. When you look past the quirkiness that band is made up of some amazing players. I do try to look a little deeper than their song “Rio”. “Come Undone” I felt always had a haunting vide. The fact that we got Lzzy Hale from Halestorm to do a duet with Russell is amazing. Lzzy I think has one of the greatest voices in rock. I consider Lzzy to be the female Russ. AL: Is there a track off the album that you really enjoy playing live? AL: “Omerta” comes out March 13 and I am sure that’s going to keep you busy for some time but, have you guys started thinking about the next album yet?